Finally place the 4 remaining whole strawberries on top in any design you like! When Desiree @ Chic Coastal Living, shared this recipe, I couldn't wait to try it. I've made it several times now, and my family loves it! I love how simple and pretty this cake looks, but it is so delicious as well! Mmm, that almost sounds too easy. Then again it will be just as easy to devour. I'll be daydreaming about this one today... gotta make a list. Nevermind, I can remember three ingredients. That looks and sounds so yummy! Fabulous job. Thanks for sharing this week at One Creative Weekend! New follower from the Pomp Party! I love this... strawberries are my favorite! 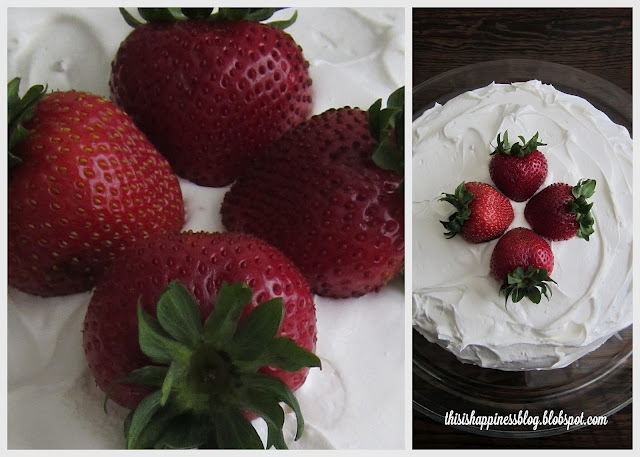 I saw your strawberries in the photo on the My Romantic Home link party, then I saw the words "butter cake" and just had to look! Wow - so easy but I bet it is delicious! And such a beautiful presentation! Thank you for sharing this. It will definitely go in my file for special occassions. Thank you so much for sharing my strawberry cake!! I just made it last weekend for my son's birthday! My boys always make requests for me to make them this cake! It's so funny because it's such a girly looking cake! haha! I have modified it a little and will be sharing an even better way to make it soon! Your family will love the new version! It's crazy good! Have a great weekend! By the way love your photos!! Much better than mine! That looks so yummy! Glad to have found your blog via the Aloha Friday Blog hop so I can follow along! Really enjoying your blog! Happy Weekend! Love strawberries, this must have been wonderful. I'm gonna miss strabwerries now in the colder seasons :( Hope your weekend is filled with happiness as well! Mmmm, This cake sounds delicious! I love fresh strawberries and we are almost coming to the end of the season so I'm using them like crazy. Can't wait to try this recipe. Thanks so much for linking up to Creative Thursday. Can’t wait to see what you share this week. Have a great week. Mmmm. You are making me hungry. This cake sounds delicious & so easy!! Plus it's beautiful! Thanks so much for sharing this at Mom's Test Meal Mondays! !